10 String Ukulele - 12 String Guitar - Harmonica - Cigar Box Guitar - Percussion - Bass. All songs are true stories taken from life subjects - Nostalgia, Humour, Poignancy etc. Everything from Car Boot sales to the Lekky Mon is covered! Mixed in among the songs and stories are a few instrumentals, a smattering of covers which may involve some clapping and foot tapping or singing along too! We have a compilation CD with songs taken from the 9 studio recorded called "Songs from the Live Shows"., and the latest CD released in 2016 called "Learning on the Job". www.chonkinfeckle.co.uk - or find us on the usual social media sites by the name "Chonkinfeckle", and also on Youtube. Chonkinfeckle formed in 2010. Their debut song 'I'm from Wigan me'! became an instant hit on YouTube and on social media. The song was re-written as the official Wigan Athletic FA Cup campaign song in 2014. 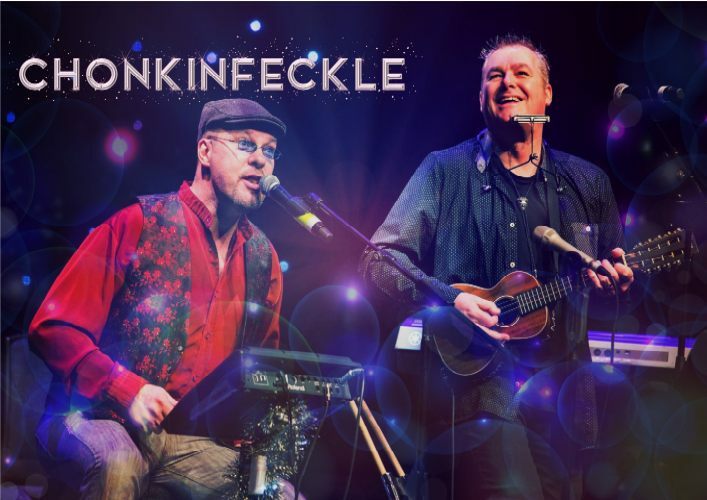 Chonkinfeckle have made numerous appearances on BBC Local Radio Manchester & Lancashire. They have been the house band with Dan Walker on BBC Radio Five Live, and appeared on the Channel 4 show, "Come Dine With me". The lads have made many theatre appearances over the country such as playing at The Lowry, Salford, Hudderfield Town Hall, Cheltenham Town Hall, Theatr Colwyn, Isle of Wight, Portsmouth, and festivals on the continent. We play to house concerts, Folk Clubs...basically, to anyone, anywhere!! Plus we have our very own 'Real Ale' beer brewed by Martland Mill Brewery in Wigan.